This huge wall map defines the high Colorado Rockies in all their glory. The large size and detailed scale allow viewers to clearly interpret the geography of Colorado’s high mountains. • Printed on high quality paper and laminated. All of the above is precisely overlaid onto detailed Shaded Relief combined with Land Cover for a true visual representation of how geography shapes the highest state in the nation. A must have map for any Coloradan! Map is shipped rolled in a tube. Landforms & mountains are precisely labeled. Equivalent or greater in detail to the 250k Quad Series. High Resolution land cover data provides a unique cartographic perspective. Land cover data is combined with shaded relief to display a realistic background. All 54 peaks standing taller then 14,000 feet above mean sea level are clearly labeled. A must have wall map for any local Peak Bagger! including National Forests, Wilderness Areas, National Monuments, National Recreation Areas and Native Tribal Lands. Public Lands are the cornerstone of the Western U.S. and are a playground for its outdoor oriented population. This map clearly defines public land boundaries and labels. Major rivers & streams provide a frame of reference & advance a better understanding of how water shapes this semi-arid landscape. 7 major US rivers find their headwaters in the Colorado Rockies. Cities and Towns are labeled and sized by population. Including elevation! Additional infrastructure like Interstates, U.S. Highways and State Highways are shown and clearly labeled. A detailed legend. Showcasing all this map has to offer! See a large edition of this map at Wheat Ridge Cyclery. Why does this map cost so much? Printing a map at this size in full color at high resolution is expensive. Lamination is also expensive. This map in printed in limited quantities. What type of material is the map printed on? The map is printed on quality stock paper and then laminated. Lamination enhances the map colors and protects the map from UV rays. Lamination also makes the map tear tough. Do you offer the map framed? Framed maps are available as a special order. But because of the large map size it is expensive. This map framed looks awesome and makes for a museum style display piece. You can see a larger framed version of this map at Wheat Ridge Cyclery …go check it out! Please contact us for more info and a price quote on framing. How is the map shipped? The map is shipped rolled in a large tube. Standard shipping is via USPS for $20 . Depending on stock expedited shipping is available at an additional cost. Please contact us before purchase for more information. Why is the deliver date at the least 1 week from the day I ordered? Because of the size of this map we have to print them in limited quantities. After printing, the map is laminated. The 1 week delivery timeframe is to give me enough time to get the map to you as a quality piece in good condition. Can I see this map in person before I buy it? Why does the larger Wheat Ridge Cyclery map have less detail? I knew you'd ask that ;) The WRC map was printed in the Spring of 2012 and before making this map available to the public I have added more detail to the hydrography (streams) and city / town elevations. What sets this map apart from others? I love the Colorado Rocky Mountains and this map was a true labor of love (see About the Cartographer). This map is unique because it is printed at a very large size and detailed scale, giving map readers a better understanding of the geography that shapes the Colorado Rocky Mountains. 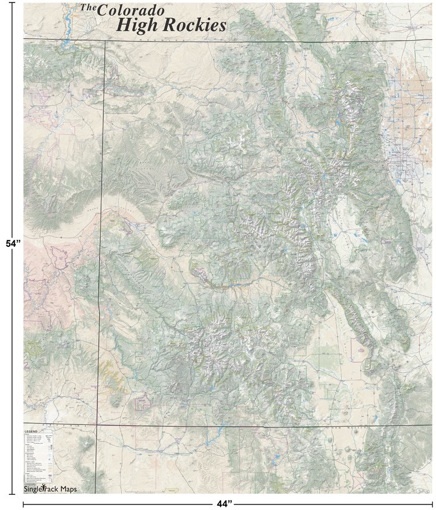 This is the first map of Colorado available at retail that includes high resolution National Land Cover Data from the USGS, displaying a true representation of the physical landscape. I thought Singletrack Maps only made trail maps, why this map? I am a professional Cartographer and create all kinds of maps. But I created this map because the Colorado Rocky Mountains are awesome! Why should I buy this map? What stores sell this map? This map is only available directly from Singletrack Maps online. Yes. We use PayPal. You do NOT need a PayPal account to order through PayPal.